Hurricanes, earthquakes and fiscal crises are preoccupations of the moment. Unless we heed the warnings being issued by three of our most brilliant strategic thinkers, Mark Steyn, Bat Ye’or and Andrew McCarthy, however, we risk an irreversible national calamity. Each of these authors has published in the past month powerful alarums about the steady erosion of the West’s societies, governing institutions and freedoms at the hands of shariah’s adherents and their enablers on the left. A consistent theme of these three important works is that we run grave risks in taking for granted the permanence of a world order dominated by liberal democracies and led by the United States. Yet, we are doing so even as evidence accumulates that Islamists, led by the Muslim Brotherhood and the 57-member Organization of Islamic Cooperation (OIC), are making steady strides towards their goal of establishing a new, transnational order. They would have it take the form of a global “Caliphate,” in which the world will be ruled in accordance with shariah. Sounds crazy? It may be. But if history teaches us anything, it is that determined, disciplined and ruthless people can do incalculable harm to others in the pursuit of crazy, supremacist goals. What is truly crazy, though, is the role being played today by “progressive” elites that are doing today what they have done in the face of totalitarians of the past: facilitating the latters’ frightening ambitions. I have had the privilege of interviewing each of these three authors over the past few weeks on Secure Freedom Radio and the message could not be more clear: We persist in such behavior at our extreme peril. European nations are now increasingly reaping the whirlwind thus sown. Of particular concern are what are known as “no-go zones” — areas where the authorities dare not enter. These are becoming increasingly common across the continent and in the U.K. as Muslim-populated enclaves apply shariah law and drive out those who do not conform. 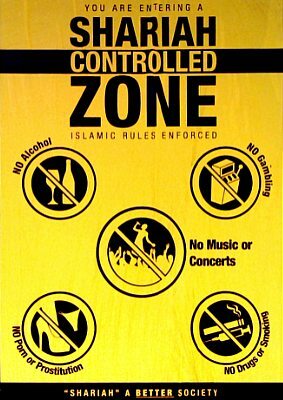 These zones are the direct result of accommodations made in the name of “diversity” and “sensitivity” to Islamic religio-cultural norms, read the supremacist doctrine of shariah. European leaders are beginning publicly to renounce such practices but their governments have yet to act accordingly. Make no mistake. If we fail to heed the warnings of Mark Steyn, Bat Ye’or and Andy McCarthy, a similar fate awaits us. Already, the U.S. government has been engaged in serial acts of appeasement of Muslim Brotherhood fronts and other shariah-adherents. These include: a Director of National Intelligence who admits to relying on such groups to provide “advice, counsel and wisdom” about “extremists” in their midst; White House direction that all government-funded counter-terrorism training will be conducted in accordance with direction of a Department of Homeland Security deeply compromised by the Brotherhood; a new Obama “strategy” for local law enforcement that requires “partnering” with what amounts to enemy front organizations; and a Hillary Clinton-engineered initiative with the OIC aimed at curbing expression that can have negative “consequences” for Muslims. In the face of such folly, Members of Congress and private citizens are striving not merely to halt these and other examples of reckless official “engagement” with the Muslim Brotherhood; they are beginning to roll back the MB. With the leadership of two freshmen congressmen, Reps. John Duncan (R-SC) and Paul Gosar (R-AZ), the House of Representatives has adopted amendments aimed at denying any taxpayer funding to the Brotherhood. These and similar initiatives by citizens across the nation are being profiled at a new website sponsored by the Center for Security Policy: TheRollback.org. Their stories serve as a powerful inspiration and as impetuses for similar efforts by others. It is past time for Americans to awaken to the danger posed by shariah and its adherents. We can no longer ignore the inroads made by these forces into Western civilization’s European flank. And we certainly cannot delude ourselves into believing that our homeland will remain immune from their predations as long as we persist in the same sorts of appeasement that havebrought our friends and allies across the Atlantic to their present, parlous state. Next Article Why Not Sterilize Drug Addicts?